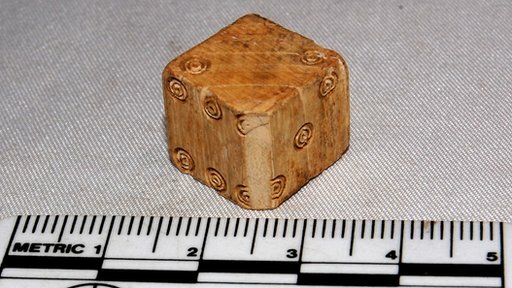 A scientific study on an ivory Roman gaming die found in Gloucestershire has ended a 40-year mystery. 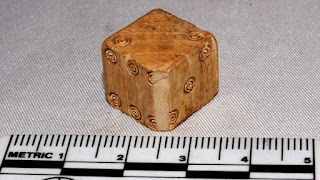 The small cube was found in Frocester near Stroud in the late 1960s but until now the type of ivory was unknown. Dr Sonia O'Connor from the University of Bradford has carried out tests at Gloucester City Museum which she says prove the ivory came from an elephant. The museum's curator David Rice said he was "disappointed" the object was not made of rarer whale ivory. "We've been puzzling about it for 30 years [since it has been in the museum]," he said. "I am disappointed, but it's good to know what it is. "It shows Gloucestershire was connected to the world even 2,000 years ago, with things coming from Africa to the county." Dr O'Connor first studied the die in the early 1980s, but revisited it after the award of new funding. It has allowed her to study objects made of hard animal tissue such as ivory, antler, bone, horn and tortoiseshell. "Although it had been identified as ivory nobody could work out what the species was, and at the time I couldn't get any further either," she said. Dr O'Connor came to the elephant ivory conclusion after studying the texture of the surface. "I would love for it to have been one of the unusual ivories for the Roman period but it is actually elephant ivory. "The species helps us understand trade routes and the importance of the piece. "The rarer the material perhaps the more valuable it was to the people who owned it." Mr Rice said he now planned to put the die on permanent display in Gloucester Museum. GM Josh Friedel At Hales Corners Challenge XVI!